Among the states, mandatory arbitration is especially widespread in California, Texas, and North Carolina, but in all of the 12 largest states by population over 40 percent of employers have mandatory arbitration policies. Much attention has focused on the use of mandatory arbitration agreements in consumer contracts, such as consumer financial contracts, cellphone contracts, and nursing home resident contracts and the implications of such agreements for consumer rights.2 There is less awareness of the use of mandatory arbitration agreements in employment contracts, but it is no less of a concern for those workers affected by it. These mandatory employment arbitration agreements bar access to the courts for all types of legal claims, including employment discrimination and sexual harassment claims based on Title VII of the Civil Rights Act, protections for employees with disabilities under the Americans with Disabilities Act, rights to maternity and medical leaves based on the Family and Medical Leave Act, and entitlements to minimum wages and overtime under the Fair Labor Standards Act. If an employment right protected by a federal or state statute has been violated and the affected worker has signed a mandatory arbitration agreement, that worker does not have access to the courts and instead must handle the claim through the arbitration procedure designated in the agreement. A crucial 1991 Supreme Court decision, Gilmer v. Interstate/Johnson Lane,4 upheld the enforceability of mandatory employment arbitration agreements, meaning that such agreements now had the potential to substantially change how the employment rights of American workers are protected. But the practical impact of mandatory employment arbitration depends on whether or not American businesses decide to require that their employees sign these agreements as a term and condition of employment. Research from the 1990s and 2000s found that mandatory employment arbitration was expanding and, by the early 2000s, nearly one-quarter of the workforce was subject to mandatory arbitration. However, there was a lack of subsequent research tracking whether this growth trend had continued beyond the early 2000s and describing the current extent of mandatory employment arbitration (see literature review, next section below). The lack of basic data on the extent of mandatory arbitration is especially concerning given that recent years have seen a series of court decisions upholding the use of mandatory arbitration in employment. These decisions have likely encouraged employers to require these agreements, expanding the use of mandatory arbitration. In two key decisions, AT&T Mobility LLC v. Concepcion (2011) and American Express Co. v. Italian Colors Restaurant (2013),5 the Supreme Court held that class action waivers in mandatory arbitration agreements were broadly enforceable. This meant that businesses could not only use mandatory arbitration agreements to bar access to the courts for individual claims, they could also shield themselves from class action claims. This gave businesses an additional incentive to include mandatory arbitration agreements in employment and other contracts. The Supreme Court is currently considering the enforceability of class action waivers in mandatory employment arbitration agreements in National Labor Relations Board v. Murphy Oil USA, Inc.6 In this case, the Court will decide whether requiring workers to waive their right to use collective action to address employment law violations is a violation of the protections of the right to engage in concerted action contained in Section 7 of the National Labor Relations Act (NLRA). If the Supreme Court accepts the argument that such waivers are in violation of the NLRA, the Court’s decision would effectively put an end to the use of class action waivers in mandatory employment arbitration agreements. However, if the Court sides with the employers’ arguments in these cases, this will signal to businesses that the last potential barrier to their ability to opt out of class actions has been removed. This would likely encourage businesses to adopt mandatory employment arbitration and class action waivers even more widely. Colvin’s 2003 survey of conflict resolution procedures used in the telecommunications industry found that 14.1 percent of establishments in that industry had adopted mandatory arbitration and that these procedures applied to 22.7 percent of the nonunion workforce in the industry (since larger establishments were more likely to have adopted mandatory arbitration) (Colvin 2008). The overall picture is one of mandatory employment arbitration expanding through the 1990s and early 2000s to nearly a quarter of the workforce. This study seeks to determine whether this expansion has continued beyond 2003 and how widespread mandatory employment arbitration is currently. To investigate the extent of mandatory employment arbitration, I conducted a national survey of private-sector American business establishments, focusing on the use of mandatory arbitration for nonunion employees. The survey was conducted from March 2017 to July 2017 and had a sample size of 627, yielding a margin of error at 95 percent confidence of plus or minus 3.9 percentage points. On the central question of whether employees were required to sign a mandatory “agreement or provision for arbitration of legal disputes with the company,” 50.4 percent of responding establishments indicated that employees in their establishment were required to enter into this type of agreement. For employers who have adopted mandatory arbitration, the survey asked them how recently they had adopted this policy. Among the employers with mandatory employment arbitration, I find that 39.5 percent of them had adopted their policies within the last five years, i.e., from 2012 to 2017, whereas 60.5 percent had adopted their policies more than five years ago. This cut-off date is important because it was in 2011 that the Supreme Court issued its decision in AT&T Mobility LLC v. Concepcion, ruling that class action waivers in the mandatory arbitration agreements were broadly enforceable. This means there was a substantial growth in the adoption of mandatory employment arbitration during this five-year period following the Supreme Court giving a green light to the use of mandatory arbitration clauses to bar class actions. Some of this growth was driven by newer, recently established companies deciding to adopt mandatory arbitration for their employees. But even among larger employers, most of whom have been around for longer periods of time, we find that many of these employers only adopted mandatory arbitration in the last five years. Census data indicate that only 10 percent of establishments with over 100 employees are less than five years old,9 but the survey data indicate that 45.3 percent of these larger establishments adopted mandatory arbitration within the last five years, indicating that there has been a surge in adoption of mandatory arbitration even among larger, older companies. As mentioned above, the likelihood that an employer will adopt mandatory employment arbitration varies with the size of the employer. Whereas 53.9 percent of all establishments had mandatory arbitration, among establishments that were part of companies with 1,000 or more employees, 65.1 percent had mandatory arbitration, which is a statistically significant difference (at the p < 0.05 level) from the 50.5 percent of establishments with fewer than 1,000 workers that had mandatory arbitration. 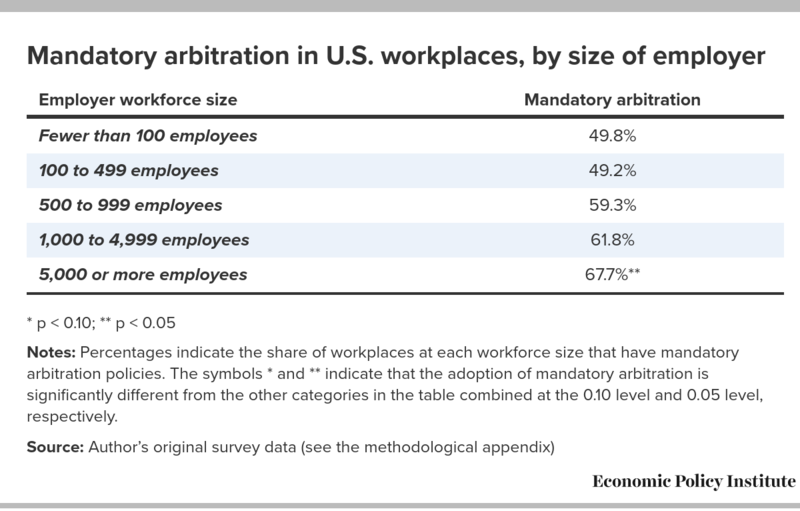 Breaking down employer size further in Table 1, we see that it is the very largest employers who have the highest rates of adopting mandatory arbitration. Notes: Percentages indicate the share of workplaces at each workforce size that have mandatory arbitration policies. The symbols * and ** indicate that the adoption of mandatory arbitration is significantly different from the other categories in the table combined at the 0.10 level and 0.05 level, respectively. In general, larger organizations with more sophisticated human resource policies and better legal counsel are more likely to adopt policies like mandatory arbitration that protect them against legal liability.10 They could also become trendsetters over time if smaller employers copy these practices that larger employers have proven to be effective in protecting employers against legal actions. 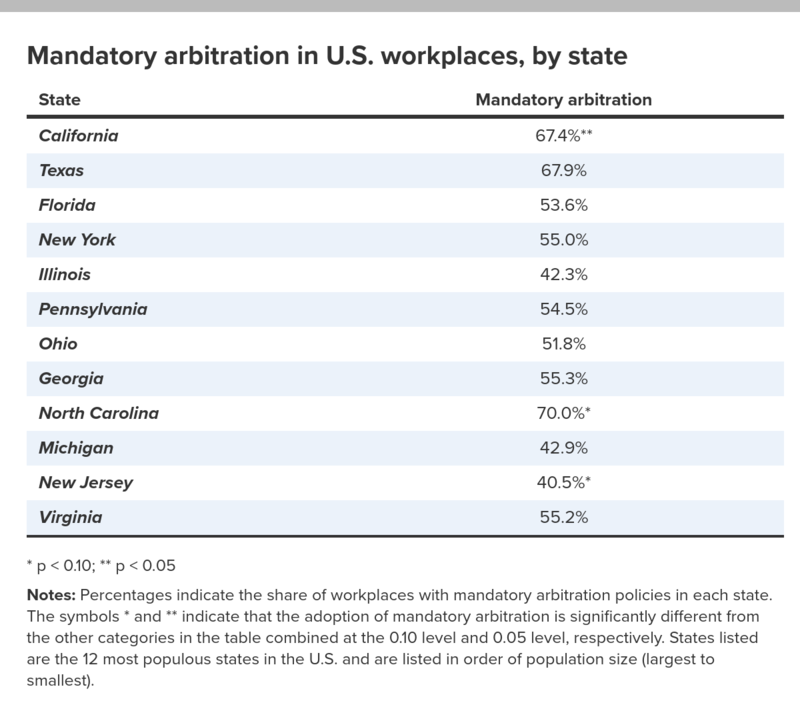 Notes: Percentages indicate the share of workplaces with mandatory arbitration policies in each state. The symbols * and ** indicate that the adoption of mandatory arbitration is significantly different from the other categories in the table combined at the 0.10 level and 0.05 level, respectively. States listed are the 12 most populous states in the U.S. and are listed in order of population size (largest to smallest). It is noteworthy that the two largest states, California and Texas, both have substantially greater rates of adoption of mandatory employment arbitration than the national average of 53.9 percent of establishments. California has long been viewed as a state where mandatory employment arbitration is especially common, a consequence of employers reacting to the relatively employee-protective environment of that state’s employment laws by using mandatory arbitration to opt out of being subject to the state court system.12 However, these results suggest that mandatory employment arbitration is equally common in Texas, where the state legal environment is generally considered to be more favorable to employers. Although for Texas we do not have enough evidence statistically to make a definitive conclusion as to the higher adoption rate for that state, these results do suggest that mandatory arbitration is not confined to the states with more employee-favorable employment laws. In general, we do see in the results a widespread adoption of mandatory arbitration across the nation, with all of the 12 largest states by population having at least 40 percent of employers adopting mandatory arbitration. Rates of imposition of mandatory arbitration also vary across different industries. 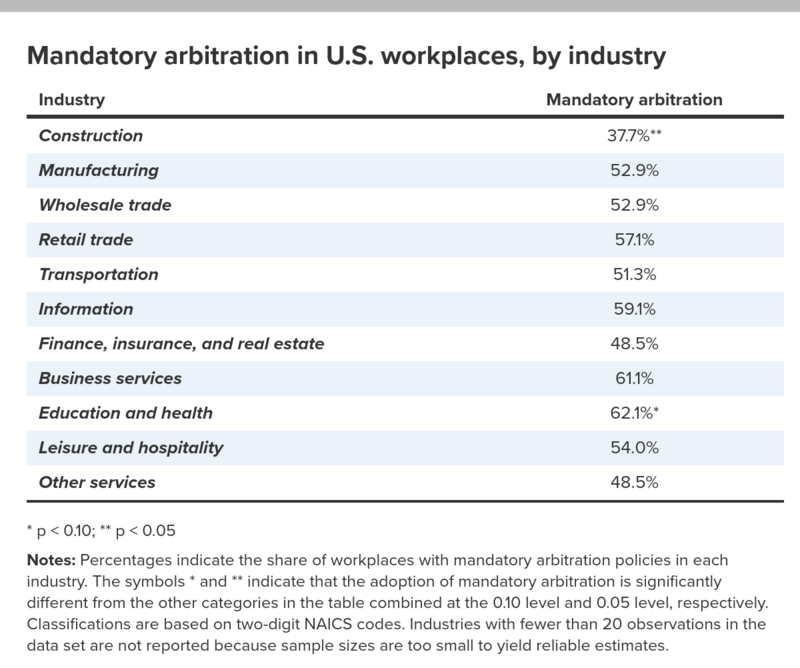 Table 3 shows adoption of mandatory arbitration by industry (based on NAICS codes). Notes: Percentages indicate the share of workplaces with mandatory arbitration policies in each industry. 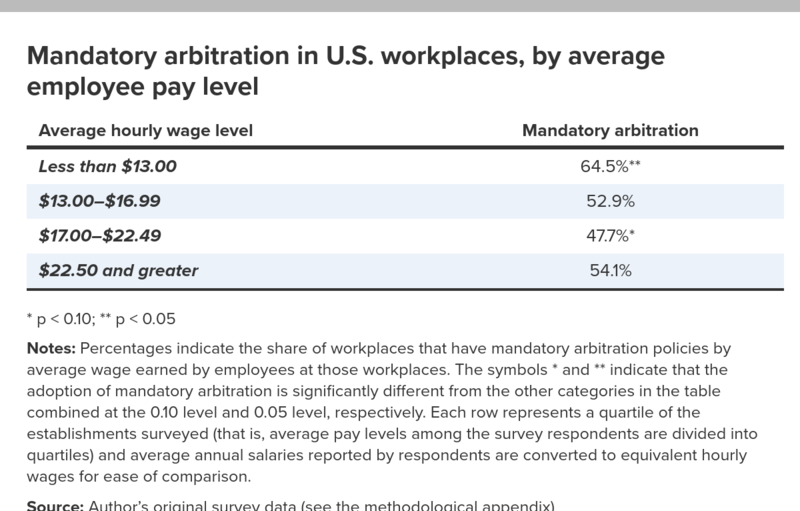 The symbols * and ** indicate that the adoption of mandatory arbitration is significantly different from the other categories in the table combined at the 0.10 level and 0.05 level, respectively. Classifications are based on two-digit NAICS codes. Industries with fewer than 20 observations in the data set are not reported because sample sizes are too small to yield reliable estimates. Since the proportion of female and racial and ethnic minority employees varies significantly across industries, we can also look at whether the rate of imposition of mandatory arbitration varies with the composition of the workforce in the industry. Construction, an industry with a predominantly male workforce, has the lowest rate of imposition of mandatory arbitration, whereas education and health, industries with a more predominantly female workforce, have the highest rate of imposition of mandatory arbitration. That leads me to ask: Are employers in industries with more predominantly female or minority workforces more likely to adopt mandatory arbitration? I can investigate this question further using data on the workforce compositions of different industries. Under the assumption that within an industry, men and women have the same likelihood of being subject to mandatory arbitration, I can estimate the share of men and women who are subject to mandatory arbitration agreements using gender breakdowns of employment by industry from Bureau of Labor Statistics data for 2016. Using this approach, I estimate that 57.6 percent of female workers are subject to mandatory arbitration, slightly higher than the rate for the overall population (56.2 percent), and 53.5 percent of men are subject to mandatory arbitration.13 Put alternatively, approximately 29.3 million female and 30.8 million male workers are subject to mandatory arbitration. Based on similar calculations, I estimate that 59.1 percent of African American workers (7.5 million workers) are subject to mandatory arbitration, 54.3 percent of Hispanic workers are subject to mandatory arbitration (10.0 million workers), and 55.6 percent of white, non-Hispanic workers (38.9 million workers) are subject to mandatory arbitration. This suggests that, overall, female workers (at 57.6 percent) and African American workers (at 59.1 percent) are the most likely to be subject to mandatory arbitration among these five groups of workers. To investigate further the impact of workforce characteristics on the adoption of mandatory arbitration, we can look at its relationship to pay levels. Are workers in higher wage or lower wage establishments more likely to have mandatory arbitration imposed on them? The survey included a question about the average pay level of workers in the establishment. In Table 4, I report the percentage of workplaces with mandatory arbitration by the average pay level of workers in the establishment. Average pay levels among the survey respondents are divided into quartiles and annual salaries converted to equivalent hourly wages for ease of comparison. Notes: Percentages indicate the share of workplaces that have mandatory arbitration policies by average wage earned by employees at those workplaces. The symbols * and ** indicate that the adoption of mandatory arbitration is significantly different from the other categories in the table combined at the 0.10 level and 0.05 level, respectively. Each row represents a quartile of the establishments surveyed (that is, average pay levels among the survey respondents are divided into quartiles) and average annual salaries reported by respondents are converted to equivalent hourly wages for ease of comparison. It is the employers with the lowest-paid workforces that are most likely to impose mandatory arbitration on their employees. This is a concern from a policy perspective because low-paid employees are particularly vulnerable to infringements of their employment rights: researchers have found widespread violations of wage and hour laws suffered by these workers (Bernhardt et al. 2008, 2009). Another workforce characteristic the survey asked about is the education level of the workforce. In Table 5, we categorize establishments by the most common education level of employees. Notes: Percentages indicate the share of workplaces that have mandatory arbitration policies by typical education level of employees at those workplaces. The symbols * and ** indicate that the adoption of mandatory arbitration is significantly different from the other categories in the table combined at the 0.10 level and 0.05 level, respectively. This comparison indicates that there is relatively little difference at lower education levels. Adoption of mandatory arbitration is slightly more common among employers whose typical employee has a college degree, but the differences are not statistically significant. Although around 60 million American workers are now subject to mandatory employment arbitration procedures, this does not mean that the number of workers arbitrating workplace disputes has increased correspondingly. It has not. Mandatory arbitration has a tendency to suppress claims. Attorneys who represent employees are less likely to take on clients who are subject to mandatory arbitration (Colvin 2014), given that arbitration claims are less likely to succeed than claims brought to court, and, when damages are awarded, they are likely to be significantly smaller than court-awarded damages (Colvin and Gough 2015). Attorney reluctance to handle such claims effectively reduces the number of claims that are brought since, in practice, relatively few employees are able to bring employment law claims without the help of an attorney. The number of claims being filed in employment arbitration has increased in recent years. In an earlier study, Colvin and Gough (2015) found an average of 940 mandatory employment arbitration cases per year being filed between 2003 and 2013 with the American Arbitration Association (AAA), the nation’s largest employment arbitration service provider.14 By 2016, the annual number of employment arbitration case filings with the AAA had increased to 2,879 (Estlund 2018). Other research indicates that about 50 percent of mandatory employment arbitration cases are administered by the AAA (Stone and Colvin 2015). This means that there are still only about 5,758 mandatory employment arbitration cases filed per year nationally. Given the finding that 60.1 million American workers are now subject to these procedures, this means that only 1 in 10,400 employees subject to these procedures actually files a claim under them each year. Professor Cynthia Estlund of New York University Law School has compared these claim filing rates to employment case filing rates in the federal and state courts. She estimates that if employees covered by mandatory arbitration were filing claims at the same rate as in court, there would be between 206,000 and 468,000 claims filed annually, i.e., 35 to 80 times the rate we currently observe (Estlund 2018). These findings indicate that employers adopting mandatory employment arbitration have been successful in coming up with a mechanism that effectively reduces their chance of being subject to any liability for employment law violations to very low levels. Although class action waivers are one of the most controversial features of mandatory arbitration procedures, it is important to recognize that mandatory arbitration agreements do not necessarily include class action waivers. Among the survey respondents whose companies had mandatory arbitration procedures, 30.1 percent included class action waivers.15 These tended to be in establishments with larger workforces, so overall 41.1 percent of employees covered by mandatory arbitration procedures were also subject to class action waivers. Relative to the overall workforce, including both those covered and those not covered by mandatory arbitration, these estimates indicate that 23.1 percent of all private-sector nonunion employees are subject to class action waivers in mandatory arbitration procedures, corresponding to 24.7 million American workers. The finding that many employers who have adopted mandatory employment arbitration have not included class action waivers in their procedures stands in contrast to the situation with consumer financial contracts, which the Consumer Financial Protection Bureau (CFPB) found almost always include class action waivers along with mandatory arbitration.16 One explanation for the lower use of class action waivers in the employment setting is the ongoing legal uncertainty about their enforceability given the NLRA issues that the Supreme Court will be deciding in the Murphy Oil case. If the decision in this case upholds the use of class action waivers in mandatory employment arbitration procedures, then we should expect a further increase in the use of these class action waivers and greater numbers of employers overall adopting mandatory arbitration. Mandatory employment arbitration is the subject of fierce legal and policy debates. There is growing evidence that mandatory arbitration produces outcomes different from those of litigation, to the disadvantage of employees, and suffers from due process problems that give the advantage to the employers who impose mandatory arbitration on their workers (Stone and Colvin 2015). What has been less clear is how widespread the impact of mandatory employment arbitration is. In the consumer arena, the CFPB’s 2015 study showed that mandatory arbitration clauses are common, being included in a majority of credit card, prepaid card, student loan, and payday loan agreements (CFPB 2015). By contrast, in the employment arena, knowledge of the extent of mandatory arbitration was limited to a few surveys from the 1990s and early 2000s, the latter of which suggested that nearly a quarter of employees might have been subject to mandatory arbitration by that point in time. The study described in this report shows that mandatory employment arbitration has continued to grow in extent and now, in over half of American workplaces, employees are subject to mandatory arbitration agreements that take away their right to bring claims against their employer in court. This represents a dramatic and important shift in how the employment rights of American workers are enforced. Rather than having their rights adjudicated through the public courts and decided by juries of their peers, more often now American workers have to bring claims—claims that are based on statutes enacted by Congress or state legislatures—through arbitral forums designated by agreements that their own employers drafted and required them to agree to as a condition of employment. The employment conditions experienced by the American worker have changed dramatically in recent decades as labor standards and their enforcement have eroded, union representation has declined, and the wage-suppressing effects of globalization have been amplified by an overvalued U.S. dollar and trade agreements that have eroded workers’ power. Against this backdrop of increased economic risk and uncertainty for workers and the disruption of traditional protections, laws protecting employment rights such as the minimum wage, the right to equal pay, and the right to a safe workplace free of harassment or discrimination based on race, gender, or religion have become increasingly important as a workplace safety net. However, these protections are at risk of being undermined if there is no effective means of enforcing them. For all the limitations of the courts, litigation has been a vital mechanism for enforcing employment rights, particularly in an era of reduced government agency resources. Mandatory employment arbitration has expanded to the point where it has now surpassed court litigation as the most common process through which the rights of American workers are adjudicated and enforced. The rise of this problematic practice needs to be given much greater attention in employment policy discussions. If the Supreme Court does not reverse its trend of supporting mandatory arbitration and instead put the brakes on enforcement of class action waivers in its upcoming decision, it will be necessary for Congress to act in order to ensure that American workers have an effective means of enforcing the rights they have been promised. Alexander J.S. Colvin is the Martin F. Scheinman Professor of Conflict Resolution and Associate Dean for Academic Affairs, Diversity, and Faculty Development at the ILR School, Cornell University. His research and teaching focus on employment dispute resolution, with a particular emphasis on procedures in nonunion workplaces and the impact of the legal environment on organizations. The survey population was drawn from Dun & Bradstreet’s national marketing database of business establishments. It was stratified by state population to be nationally representative. The survey population was restricted to private-sector business establishments of 50 or more employees, and the analysis was restricted to procedures covering nonunion employees. The individual respondents were the establishment’s human resource manager or whichever individual was responsible for hiring and onboarding employees. The reason for use of this individual as the person to respond to the survey is that mandatory arbitration agreements are typically signed as part of the onboarding paperwork when a new employee is hired. As a result, the manager responsible for this process is the individual most likely to be knowledgeable about the documents the new employee is signing. Typical job titles of individual respondents included human resource director, human resource manager, personnel director, and personnel manager. Data collection started in March 2017 and was completed in July 2017. A total of 1,530 establishments were surveyed, from which 728 responses were obtained, representing an overall response rate of 47.6 percent. Some survey responses had missing data on specific questions; however, 627 respondents provided complete data on the key variables of interest. The response rate and sample size are similar to those obtained in past establishment-level surveys of employment relations and human resource practices. The median establishment size in the sample is 90 employees and the average size is 226 employees. Most establishments are single-site businesses, while 38.2 percent are part of larger organizations. These larger organizations have an average workforce size of 18,660 employees. Overall, 5.2 percent of establishments in the sample are foreign-owned. 6. NLRB v. Murphy Oil USA, Inc., No. 16-307. For more about the Murphy Oil case and the implications of the pending Supreme Court decision, see McNicholas 2017. 7. The GAO’s survey initially indicated that 9.9 percent of establishments had mandatory arbitration procedures; however, on follow-up, a number of them indicated that they had made mistakes in reporting, such as confusing union labor arbitration procedures with nonunion mandatory employment arbitrations. Adjusting for these erroneous responses, only 7.6 percent of the establishments actually had mandatory employment arbitration. 8. This estimate is based on year 2016 data from BLS 2017, which reports an overall private-sector workforce of 115.417 million in 2016, among which 8.437 million are union-represented private-sector workers, with the remainder of 106.980 million workers being nonunion. 9. Based on data provided in U.S. Census Bureau Establishment Characteristics data tables (various years). 10. See, e.g., Edelman 1992, showing that larger organizations are more likely to adopt organizational policies designed to protect them from the impact of civil rights laws. 11. We only report the adoption rate for the 12 largest population states to ensure that we have a sufficient number of observations per state to provide reliable estimates: each of these states had at least 25 observations in the sample. Although the survey is national in coverage, the smaller states had fewer observations per state. 12. See Colvin and Gough 2015 for a more detailed discussion of the state law environments affecting mandatory arbitration in California and Texas. 13. Estimates of the rate of mandatory arbitration coverage for minority and female workers were calculated based on publicly available data since these were not measured directly in the survey. Adjustments for industry employment levels and percentages of female, African American, and Hispanic employees by industry are based on data provided in: Bureau of Labor Statistics, “Labor Force Statistics from the Current Population Survey” (2017). A rate of coverage was calculated by summing across industries the product of the mandatory arbitration coverage rate for the industry and the number of female or minority workers in the industry, to calculate a total number of female or minority workers covered by mandatory arbitration, and then dividing by the total female or minority workforce size. The number of male workers subject to mandatory arbitration is larger because of the greater number of males in the labor force, despite the higher rate at which female workers are subject to mandatory arbitration. 14. See Colvin and Gough 2015, 1027, reporting that 10,335 claims were filed with the AAA over the 11-year period from 2003–2013. 15. Here I am only looking at whether there was an explicit class action waiver in the arbitration agreement. It could also be the case that an arbitrator or a court could interpret an agreement without an explicit waiver as nevertheless implying that claims in arbitration can only be brought individually. However the inclusion of explicit class action waivers are important because they allow the employer to remove any doubt about the ability to bring a class action. 17. A study by Zev Eigen (2008) found that a majority of Circuit City employees he interviewed were unaware that they had signed arbitration agreements or of the import of such agreements, even though the company had a longstanding policy of requiring its employees to sign mandatory arbitration agreements and even though Circuit City’s arbitration policy had been the subject of an important case on the enforceability of these agreements that was decided by the Supreme Court in 2001. 18. One of the most important differences is that labor arbitration procedures are jointly established and administered by unions and management, in contrast to mandatory arbitration, which is unilaterally established by the employer. In addition, most labor arbitration procedures do not bar employees from bringing statutory employment claims separately through the courts. Bernhardt, Annette, Heather Boushey, Laura Dresser, and Chris Tilly, eds. 2008. The Gloves-Off Economy: Workplace Standards at the Bottom of America’s Labor Market. Ithaca, N.Y.: Cornell Univ. Press. Bernhardt, Annette, Ruth Milkman, Nik Theodore, Douglas Heckathorn, Mirabai Auer, James DeFilippis, Ana Luz González, Victor Narro, Jason Perelshteyn, Diana Polson, and Michael Spiller. 2009. Broken Laws, Unprotected Workers: Violations of Employment and Labor Laws in America’s Cities, 2009. Center for Urban Economic Development, National Employment Law Project, and UCLA Institute for Research on Labor and Employment. Bureau of Labor Statistics (BLS). 2017. “Union Members – 2016” (news release). Released January 26, 2017. Colvin, Alexander J.S. 2008. “Empirical Research on Employment Arbitration: Clarity amidst the Sound and Fury?” Employee Rights and Employment Policy Journal 11, no. 2 (October): 405–447. Colvin, Alexander J.S. 2014. “Mandatory Arbitration and Inequality of Justice in Employment.” Berkeley Journal of Employment and Labor Law 35, no. 1 (May): 71–90. Colvin, Alexander J.S., and Mark Gough. 2015. “Individual Employment Rights Arbitration in the United States: Actors and Outcomes.” ILR Review 68, no. 5 (October): 1019–1042. Edelman, Lauren B. 1992. “Legal Ambiguity and Symbolic Structures: Organizational Mediation of Civil Rights Law.” American Journal of Sociology 97, no. 6 (May): 1531–1576. Eigen, Zev. 2008. “The Devil in the Details: The Interrelationship among Citizenship, Rule of Law and Form-Adhesive Contracts.” Connecticut Law Review 41, no. 2 (December): 1–50. Estlund, Cynthia L. 2018. “The Black Hole of Mandatory Arbitration.” North Carolina Law Review 96; NYU School of Law, Public Law Research Paper No. 18-07. Feuille, Peter, and Denise R. Chachere. 1995. “Looking Fair and Being Fair: Remedial Voice Procedures in Nonunion Workplaces.” Journal of Management 21: 27–36. McNicholas, Celine. 2017. “Supreme Court Should Uphold Working People’s Fundamental Rights in Murphy Oil.” Working Economics (Economic Policy Institute blog), September 27, 2017. Stone, Katherine V.W., and Alexander J.S. Colvin. 2015. The Arbitration Epidemic. Economic Policy Institute Briefing Paper no. 414. U.S. Census Bureau. Various years. Establishment Characteristics Data Tables. Business Dynamics Statistics (BDS) data series. Accessed March 6, 2018.